The 130-gallon aquarium I bought came with an 18" plecostomus. He's not compatible with the planted tank plan I bought it for, so I set up a 55-gallon tank for him in the bedroom. 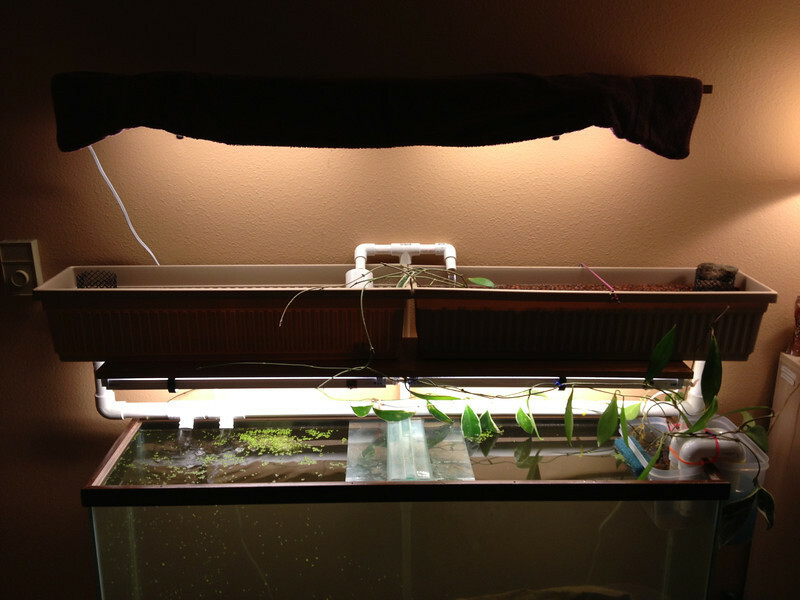 Then I decided to use his aquarium to power an indoor aquaponic system. This is a photo diary of that particular adventure. I installed a second shelf over the first one. This time they were out of the brackets I got last time, so I had to get the longer ones. I forgot (again) to think about the light fixtures having to fit. Because of the different brackets, I had to mount them with the bulb facing out, which makes them very bright and glary. For now I have an old towel serving as a valance to cut the glare, which is a major flaw in my "aesthetically unoffensive" scheme. So I've got to figure out something better, pretty quickly. I made gravel guards out of gutter screening, to go around the drain pipes in the grow boxes. You can see them peeking out at either end. I also found a bag of Hydroton, which is expanded clay growing media, in, of all places, Ace Hardware in our little town! They only had the one bag, though, and it wasn't enough. You can see it in the grow box on the right.